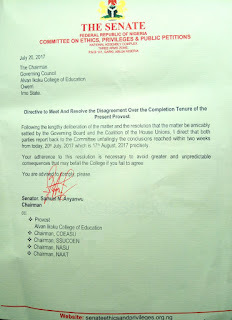 Baring any last minute changes, the Joint Action Committee (JAC) of Alvan Ikoku Federal College of Education, Owerri, may declare industrial action anytime from tomorrow, 2nd day of August, 2017. 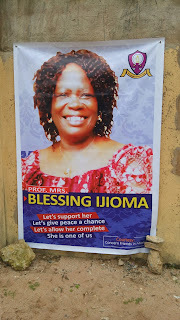 2nd of August, incidentally, is the supposed due date for the retirement of the Provost of the College, Dr. Mrs. 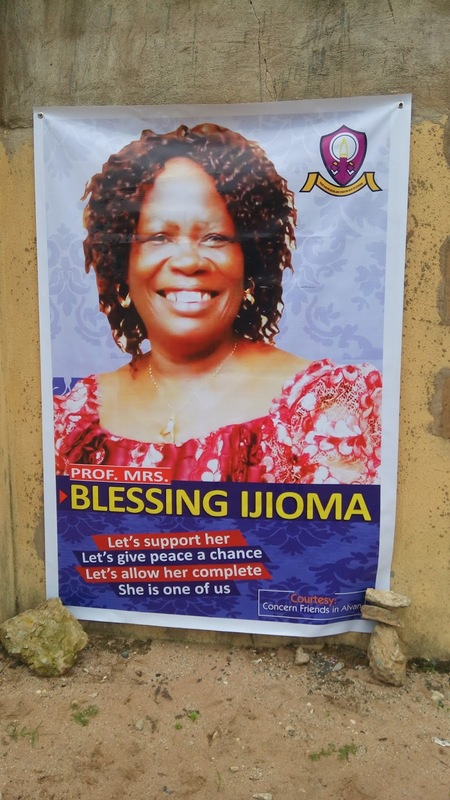 Blessing Ijioma, having attained the ripe age of 65, and from the body language of the unions, strike looms. 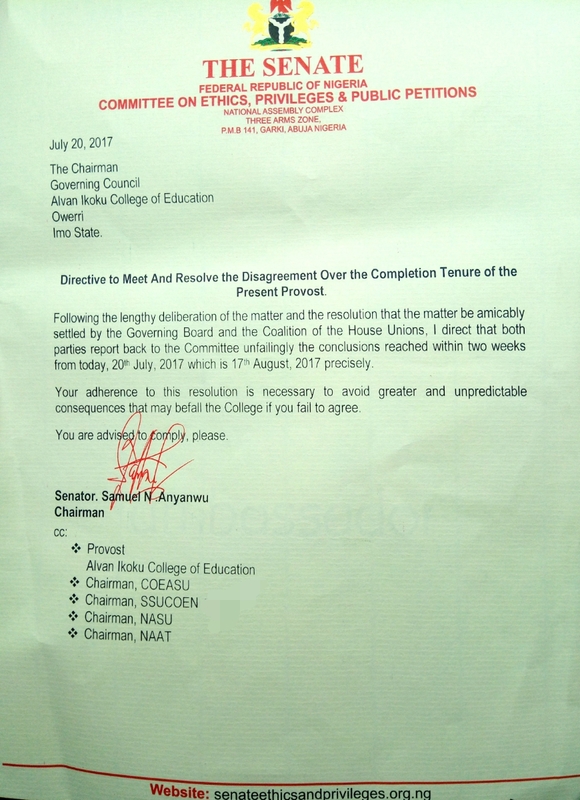 It can be recalled that two weeks ago, the Senate committee on Ethics, Privileges and Public Petitions had directed the Governing council of the institution to, within two weeks, summon a meeting with the unions and resolve the leadership impasse threatening the peace and stability of second generation citadel of learning. 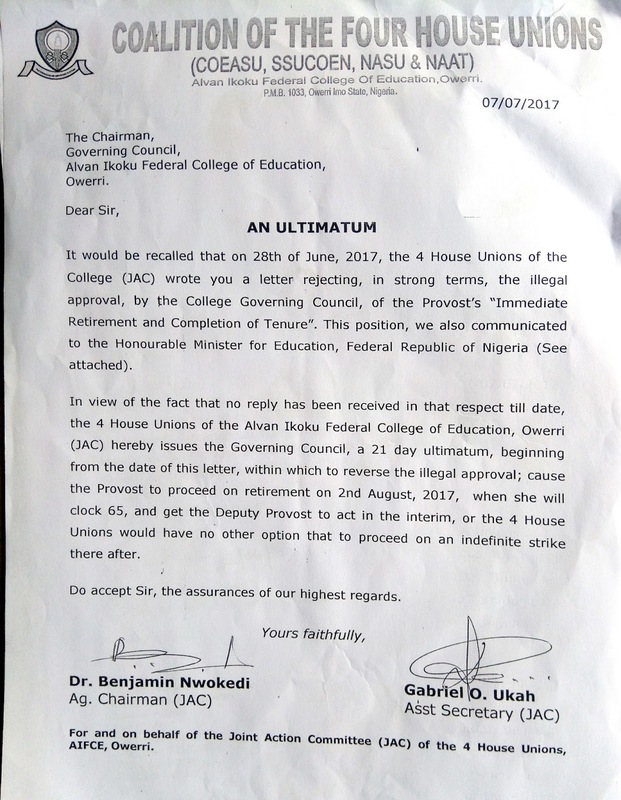 The unions from beginning felt that it was a ploy to buy time for the provost by altering the initial two weeks ultimatum given to the council by the unions, which expired last week, and it seems they were right. 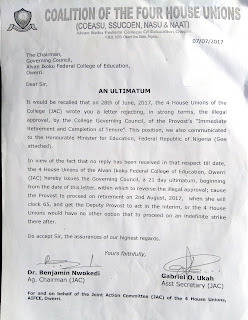 This is because as at press time, the unions have not been summoned to any meeting by the council, the provost has not proceeded on retirement and the Federal Ministry of Education has not reacted in any way. The unions had called for a congress last week to brief the staff on their activities thus far and possible way forward, as they envisaged that the council having compromised themselves will have a hard time doing the right thing.